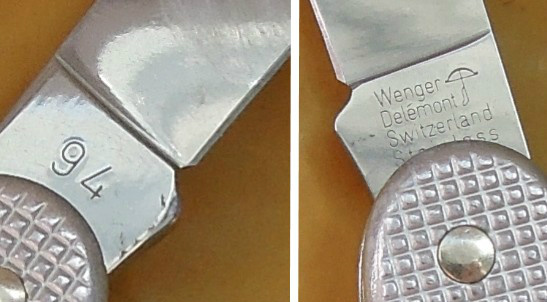 In the mail today was this nice Wenger Alox SAK. It is a Si with bail and after a nice cleaning, sharpening and look-over it is ready for pictures. 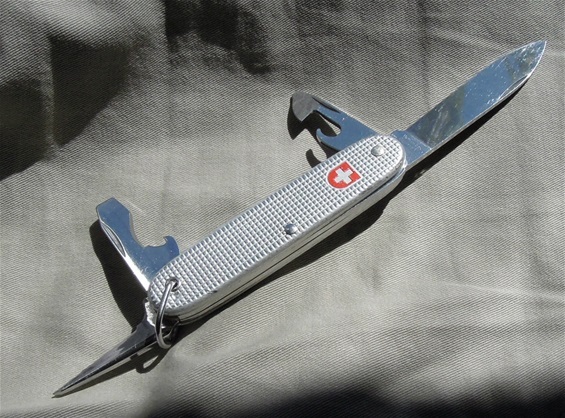 All the functions have been used on this Standard Issue civilian model. After pictures it will get some oil to secure best functionality. All the springs are strong and the construction got no play what so ever and that is well. These SAK are typically hard used knives. This is a 1994 edition that still got the thick flat screwdriver with wire scraper and cap opener. There is still no notch for cable bending yet. The rivet for the blade and can opener with screwdriver tip is most likely nickel-silver and the center rivet and rivet for the bail and functions is steel. I like the robust feel these SAK got and I enjoy looking over used ones to learn more about the quality. If you look on my 1975 model on the page to the left you can read some further on what are the typical damages you find from abuse. These alox knives are considered some of the strongest made and there are variants. They are popular with enthusiasts and collectors. They also got that extra solid functionality that makes them a bit extra.